Canada's big city mayors say they need billions of dollars and a 20-year plan to fix the country's crumbling infrastructure, which they say threatens the economy and even Canadians' lives. 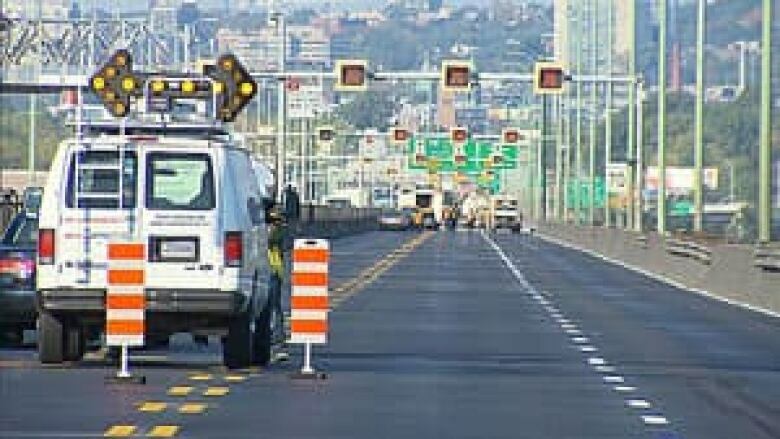 Canada's big city mayors say they need billions of dollars and a 20-year plan to fix the country's crumbling roads and sewer systems, but promise to match the federal government's contribution with their own funding. Vancouver Mayor Gregor Robertson says they recognize the money problems the federal government is dealing with, but reminded them that deferred and delayed infrastructure work will end up costing more. There is a "very pressing need for all of us to do more," said Robertson, chair of the Big City Mayors' Caucus. The group is made up of the mayors of 22 member cities of the Federation of Canadian Municipalities. "The cities are ready to do our part," by matching the federal funds, he added. Deferring infrastructure investments could also cost lives, the mayors suggested. Asked if they worry every day about someone being killed because of weak infrastructure, the mayors agreed. "I think there is concern for all of us with regard to crumbling infrastructure," said Robertson. "There's no doubt, particularly on the West Coast, [where] we've had large earthquakes. With the threat of natural disasters, whether it's earthquakes or hurricanes, we have a need to constantly update our infrastructure to ensure it can withstand those pressures, otherwise human lives are at risk." In Vancouver earlier this week, the Federation of Canadian Municipalities said cities and towns need another $2.5 billion a year in order to keep Canada competitive. The 22-member big city mayors' caucus would like to see a commitment in next year's federal budget. The organization says that would bring the total to $5.75 billion a year from the federal government — funds that should be matched by the provinces and municipalities themselves. The federation says $1 billion of it should be dedicated to fighting gridlock that it says costs the Canadian economy $10 billion a year in lost productivity. The mayor of Mississauga, in the Greater Toronto Area, said if Canada wants to remain competitive in a global economy it has to bring its infrastructure up-to-date. "The prime minister is going abroad as we all know, and we appreciate that, to encourage investment to Canada and I think that's wonderful," said Hazel McCallion. "But if [foreign investors] come here and they can't move their products in the GTA or move their people, they're not going to be very happy." McCallion added that Harper has visited China and India, countries where billions of dollars have been invested in infrastructure, and that it's "astonishing" that Canada hasn't followed suit. The current federal funding regime ends in 2014 and the Conservative government is working on a new plan. Transportation, Infrastructure and Communities Minister Denis Lebel thanked the mayors in a statement to CBC News. "[Their submission] will be considered along with the input we've already received from municipalities, provinces, territories and other stakeholders, as we continue to develop our new long-term infrastructure plan. Our new plan will recognize the need for investments in infrastructure while ensuring affordability and respecting taxpayers' ability to pay, in this time of restraint," Lebel said. Currently, for every dollar of taxes Canadians pay, municipalities get only eight cents, the mayors said. "On eight cents, we just can't get it done," said Don Atchison, the mayor of Saskatoon. Calgary Mayor Naheed Nenshi said the city's budget, while strained, can cover non-capital needs. But massive investments, such as a proposed new $3-billion light rail line, can have a cost equal to the city's entire operating budget, he said. "I don't expect the federal and provincial governments to come to Calgary's city hall with a cheque for $3 billion tomorrow. I'd like it, but I think that's a little bit unreasonable. But what I need to know is if I build the $3-billion LRT, how am I going to pay it back over a long period of time?" Nenshi said the current system is great for politicians, who can point to each other when taxpayers ask for services. Mayors can point to the provincial and federal governments, who have bigger budgets from which to fund major projects like an LRT, and premiers and federal politicians can point back to the mayors, who are responsible for infrastructure. "And we can do it all day — inter-jurisdictional buck-passing. And the LRT doesn't get built," Nenshi said. New Democrat MP Olivia Chow says the next six months will be critical for cities. "What the government should do is adopt the FCM proposal and take politics out of supporting municipalities and fund municipalities by population, per capita, with a designated pot," she said. Chow backs the federation's proposal that would set aside one pot of money for transit and cutting commute times, one for water and another for core infrastructure. The per capita funding would mean no more need to apply for money to pay for specific projects. The mayors of Toronto and Montreal, Canada's two biggest cities, did not attend Thursday's meeting in Ottawa. Toronto mayor Rob Ford has been in court this week fighting a $6-million libel suit filed by a local businessman, although Ford was not in court Thursday. Gérald Tremblay stepped down as Montreal's mayor earlier this month amid allegations he turned a blind eye to corruption and electoral misspending by his party. He has denied any wrongdoing or knowledge of corruption within his administration. Montreal's city council has been thrown into disarray in the wake of his resignation, with a number of councillors quitting and some considering running for interim mayor. Another mayor, Joe Fontana, was also missing from the meeting and has been the subject of recent controversial headlines. The London mayor and former Liberal MP is under investigation by the RCMP over allegations that $20,000 in federal funds were used to pay for his son's wedding in 2005. The mayors were asked about the problems plaguing municipalities in Quebec. Laval's mayor, Gilles Vaillancourt, also quit amid corruption allegations. "We're not going to comment on the allegations regarding any other mayors not present," Robertson responded.